It’s Thursday! Yesssss! Can’t wait for OCC! And then…….. I worry! Rehearsals are a very humbling experience for me. As I look out on eager faces, I feel a great deal of responsibility to make each and every singer’s experience the best that it can be. Will they like the music? Will they find it too hard? Too easy? Will they have fun? Will they think I work them too hard? Will they know how much I love them even while I am pushing them to excel? You see, it has always been my passion to make the music come alive, jump off the page and honor the composer’s intention. And so I do work the score and the singers and myself! But that’s just the beginning. 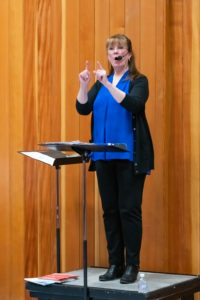 Nothing will come alive or jump off the page without the human component and that’s why being the Artistic Director of the Outer Cape Chorale is so thrilling for me. In those moments when we are really making music, transcending all the troubles of the day, I literally get goosebumps and as many of you have seen, even begin to cry. In those moments, it is not that I am aware of any particular emotion, it is the beautiful tone, it’s the turn of the phrase, it’s the passion on the singers’ faces, it’s the collective community that no other experience on this earth can provide! When all of that comes together my heart falls in love with each and every one of you all over again. It is a gift and a privilege to be a choral conductor because it is what I love to do, but to be the director of the Outer Cape Chorale? Precious and priceless and I am so very grateful!